Sunstone is a gorgeous gemstone which appears to shine with light from certain angles, due to reflections caused by copper inclusions. It is a beautiful stone which comes in multiple colours, caused by the inclusion of red copper, goethite, or hematite pieces, which cause an interesting optical effect when the gemstone is viewed in natural sunlight. The most common colours of this stone are oranges, reds, and browns, but purple, blue and green pieces do exist. 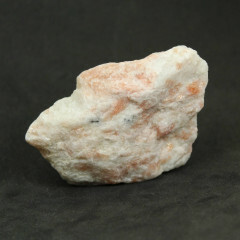 It is found in a few places worldwide – Norway, Siberia, and throughout the USA – it is the state gemstone of Oregon, where it is known as Oregon Sunstone, and can be found in some darker colours. The variant from Oregon is considered quite desirable and is sometimes facet cut. It may also be known as ‘adventurine feldspar’; the stone itself is composed of Feldspar, and possesses an optical effect similar to Adventurine. This effect is known as ‘aventurescence’ and occurs in several Feldspars, most prominently in Labradorite. 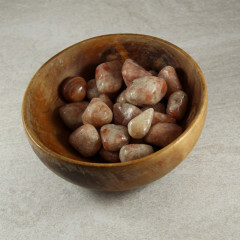 It is thought to be a good stone for leadership and focus, and help with decreasing stress. It is considered helpful with depression, and helping with the holders self confidence.